represents an inverse gamma distribution with shape parameter α and scale parameter β.
represents a generalized inverse gamma distribution with shape parameters α and γ, scale parameter β, and location parameter μ.
InverseGammaDistribution[α,β] is also known as the inverted gamma distribution. InverseGammaDistribution[α,β] is equivalent to TransformedDistribution[1/x,xGammaDistribution[α,1/β]]. 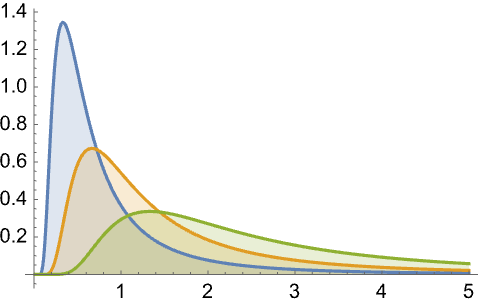 InverseGammaDistribution[α,β,γ,μ] is equivalent to TransformedDistribution[1/x,xGammaDistribution[α,1/β,γ,μ]]. 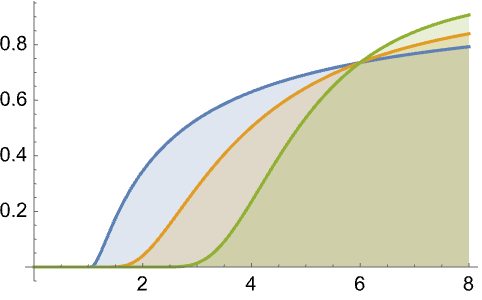 InverseGammaDistribution allows α, β, and γ to be any positive real numbers and μ to be any real number. 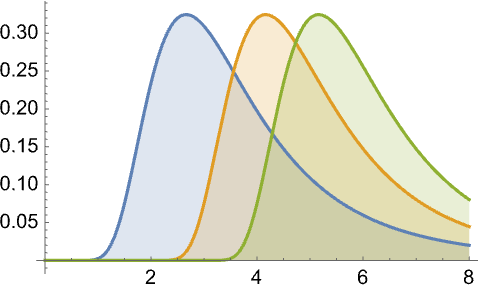 InverseGammaDistribution can be used with such functions as Mean, CDF, and RandomVariate. 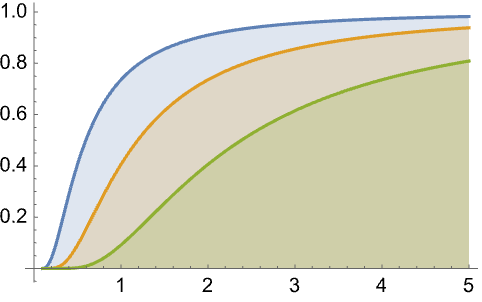 InverseGammaDistribution[α,β,γ,μ] represents a continuous statistical distribution defined over the interval and parametrized by a real number μ (called a "location parameter"), two positive real numbers α and γ (called "shape parameters"), and a positive real number β (called a "scale parameter"). 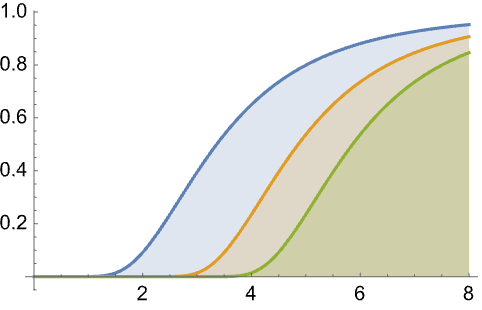 Overall, the probability density function (PDF) of an inverse gamma distribution is unimodal with a single "peak" (i.e. a global maximum), with the parameter μ determining the horizontal location of the PDF and the parameters α, β, and γ determining its overall shape (its height, its spread, and its concentration near the axis). In addition, the tails of the PDF are "thin" in the sense that the PDF decreases exponentially rather than decreasing algebraically for large values of . 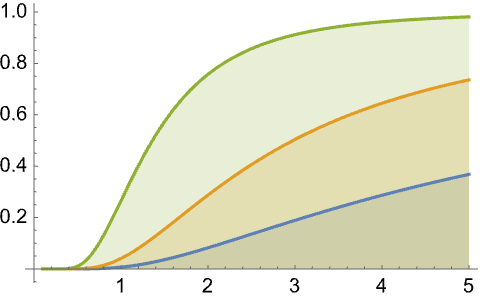 (This behavior can be made quantitatively precise by analyzing the SurvivalFunction of the distribution.) The four-parameter version is sometimes referred to as the generalized inverse gamma distribution, while the two-parameter form InverseGammaDistribution[α,β] (which is equivalent to InverseGammaDistribution[α,β,1,0]) is often referred to as "the" inverse gamma distribution. InverseGammaDistribution[α,β,γ,μ] is the distribution followed by the reciprocal of a generalized gamma-distributed random variable. In other words, if is a random variable and XGammaDistribution[α,β,γ,μ] (where denotes "is distributed as"), then 1/XInverseGammaDistribution[α,β,γ,μ]. In Bayesian probability, the inverse gamma distribution is used as a marginal posterior or as a conjugate prior distribution in inferencing of normally-distributed data whose variance is unknown if an uninformative prior or if an informative prior is used, respectively. The inverse gamma distribution and its generalization are also used in other miscellaneous Bayesian applications in addition to being used as tools of study in various areas including reliability theory, manufacturing systems, machine learning, and survival analysis. RandomVariate can be used to give one or more machine- or arbitrary-precision (the latter via the WorkingPrecision option) pseudorandom variates from an inverse gamma distribution. Distributed[x,InverseGammaDistribution[α,β,γ,μ]], written more concisely as xInverseGammaDistribution[α,β,γ,μ], can be used to assert that a random variable x is distributed according to an inverse gamma distribution. Such an assertion can then be used in functions such as Probability, NProbability, Expectation, and NExpectation. 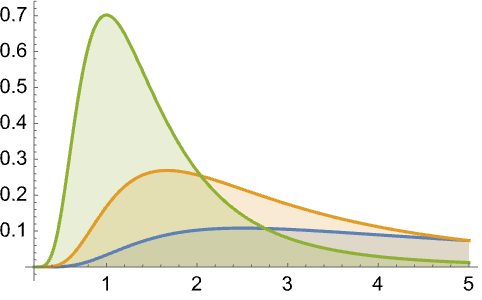 The probability density and cumulative distribution functions for inverse gamma distributions may be given using PDF[InverseGammaDistribution[α,β,γ,μ],x] and CDF[InverseGammaDistribution[α,β,γ,μ],x]. The mean, median, variance, raw moments, and central moments may be computed using Mean, Median, Variance, Moment, and CentralMoment, respectively. DistributionFitTest can be used to test if a given dataset is consistent with an inverse gamma distribution, EstimatedDistribution to estimate an inverse gamma parametric distribution from given data, and FindDistributionParameters to fit data to an inverse gamma distribution. ProbabilityPlot can be used to generate a plot of the CDF of given data against the CDF of a symbolic inverse gamma distribution, and QuantilePlot to generate a plot of the quantiles of given data against the quantiles of a symbolic inverse gamma distribution. TransformedDistribution can be used to represent a transformed inverse gamma distribution, CensoredDistribution to represent the distribution of values censored between upper and lower values, and TruncatedDistribution to represent the distribution of values truncated between upper and lower values. CopulaDistribution can be used to build higher-dimensional distributions that contain an inverse gamma distribution, and ProductDistribution can be used to compute a joint distribution with independent component distributions involving inverse gamma distributions. 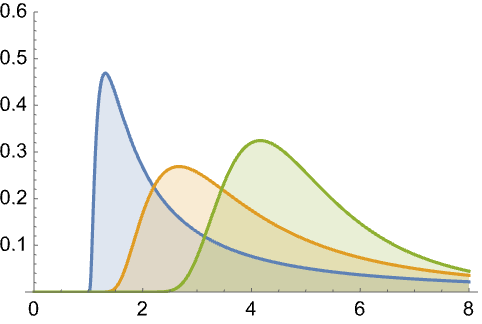 InverseGammaDistribution is closely related to a number of other distributions. For example, InverseGammaDistribution is related to InverseChiSquareDistribution (and hence to ChiSquareDistribution) in that the PDF of InverseGammaDistribution[ν/2,1/2] is precisely the same as InverseChiSquareDistribution[ν,1/ν]. InverseGammaDistribution is generalized by PearsonDistribution, generalizes LevyDistribution, and is closely related to a number of other distributions including MoyalDistribution, LogGammaDistribution, ErlangDistribution, BetaDistribution, ExpGammaDistribution, RayleighDistribution, ChiDistribution, WeibullDistribution, and StudentTDistribution.